Burgers: Are These The Most Unique Burgers in America? You are in Home > Blog > Food & Drinks > Are These The Most Unique Burgers in America? Practically every major city in America has claimed at one point or another to have the most unique burgers in the country. Anaheim's peanut butter and jelly burgers, New York City's deep fried variety and the famous lobster burger in Las Vegas are some of the first ones to come to mind. But who really makes the most unique burgers in America? You'll find some of the answers in this nifty infographic from Venere. The visual guide is also chock full of burger facts and will help you pinpoint who is making what and where. Interesting finds include San Diego's anteloupe, buffalo and kangaroo burgers and Louisiana's Hamburger Po' Boys. 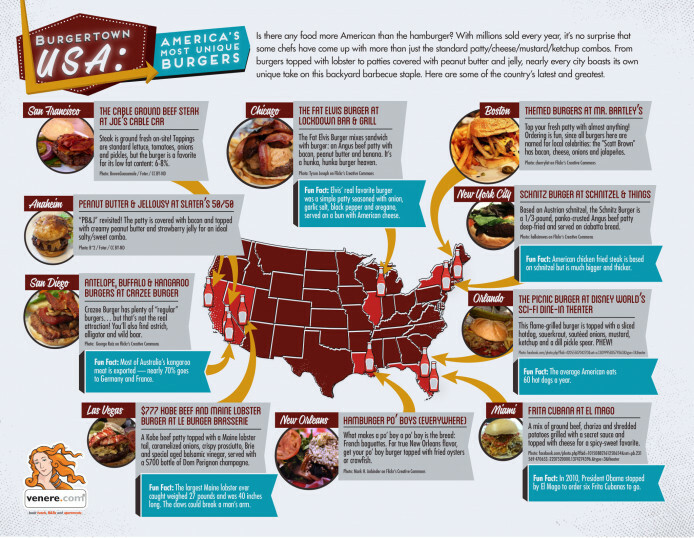 While the inforgraphic scans the country in search of the most unique burgers, we've got to say they all look good to us. In fact, we're already getting hungry.